TH E M R EP O RT | 11 SPONSORED CONTENT Factom Harmony Your first blockchain enabled mortgage origination and audit tool H ave you heard of block- chain? Have you heard all the hype about how it is changing the world? The banking and insurance indus- tries have already begun invest- ing millions into the use of this new technology. Is the mortgage industry next? The answer is yes because it will be as useful as the internet and email. Factom, one of the leading blockchain companies in the industry, just released their new product specifically for the mort - gage industry. Factom Harmony, their debut mortgage product, con- verts your existing imaging system into a comprehensive simple and secure digital compliance vault. Harmony uses a combination of blockchain technology, digital sig- natures, and a set of cryptographic functions developed by the U.S. National Security Agency. With this technology Harmony creates a complete, secure, and unalterable electronic catalogue of the loan file that can be accessed and validated at any time by any authorized parties. It creates a digitally signed proof of the closed loan file. 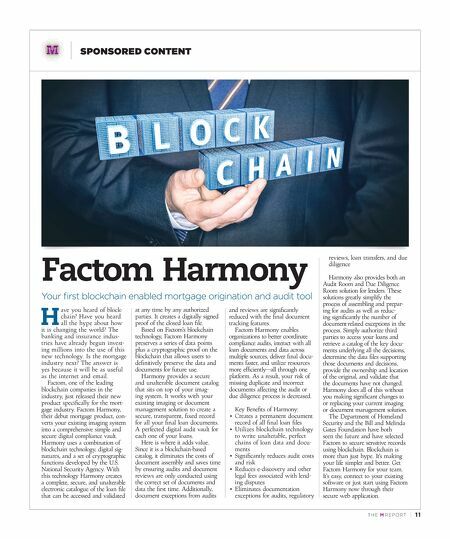 Based on Factom's blockchain technology, Factom Harmony preserves a series of data points plus a cryptographic proof on the blockchain that allows users to definitively preserve the data and documents for future use. Harmony provides a secure and unalterable document catalog that sits on top of your imag - ing system. It works with your existing imaging or document management solution to create a secure, transparent, fixed record for all your final loan documents. A perfected digital audit vault for each one of your loans. Here is where it adds value. Since it is a blockchain-based catalog, it eliminates the costs of document assembly and saves time by ensuring audits and document reviews are only conducted using the correct set of documents and data the first time. Additionally, document exceptions from audits and reviews are significantly reduced with the final document tracking features. 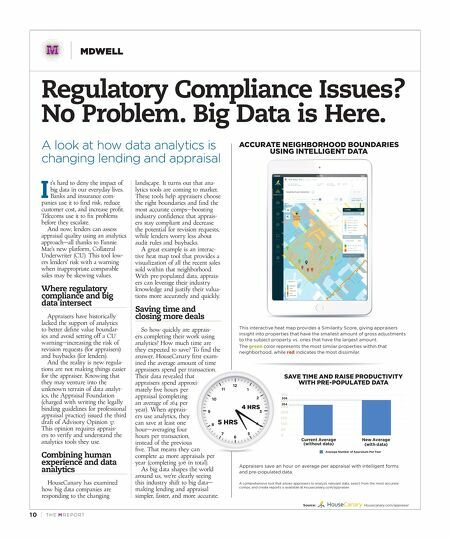 Factom Harmony enables organizations to better coordinate compliance audits, interact with all loan documents and data across multiple sources, deliver final docu - ments faster, and utilize resources more efficiently—all through one platform. As a result, your risk of missing duplicate and incorrect documents affecting the audit or due diligence process is decreased. Key Benefits of Harmony: • Creates a permanent document record of all final loan files • Utilizes blockchain technology to write unalterable, perfect chains of loan data and docu - ments • Significantly reduces audit costs and risk • Reduces e-discovery and other legal fees associated with lend - ing disputes • Eliminates documentation exceptions for audits, regulatory reviews, loan transfers, and due diligence Harmony also provides both an Audit Room and Due Diligence Room solution for lenders. These solutions greatly simplify the process of assembling and prepar - ing for audits as well as reduc- ing significantly the number of document-related exceptions in the process. Simply authorize third parties to access your loans and retrieve a catalog of the key docu - ments underlying all the decisions, determine the data files supporting those documents and decisions, provide the ownership and location of the original, and validate that the documents have not changed. Harmony does all of this without you making significant changes to or replacing your current imaging or document management solution. The Department of Homeland Security and the Bill and Melinda Gates Foundation have both seen the future and have selected Factom to secure sensitive records using blockchain. Blockchain is more than just hype. It's making your life simpler and better. Get Factom Harmony for your team. It's easy, connect to your existing software or just start using Factom Harmony now through their secure web application.